The UO Opera Ensemble, a resident company of the University of Oregon School of Music and Dance, has won second place in the National Opera Association’s annual Collegiate Opera Scenes Competition, Division II, for performers age 23 and older. The Jan. 3 competition at the NOA’s annual convention – held this year at the Hilton Portland and Executive Towers in Portland – allowed UO opera students an opportunity to learn from a competitive environment. First place in the scenes completion was awarded to the University of Montevallo, located in Montevallo, Alabama. UO student performers who participated in the NOA’s scenes competition included Caitlin Hennessy, Alyse Jamieson, Alishia Piper and Rebecca Sacks. 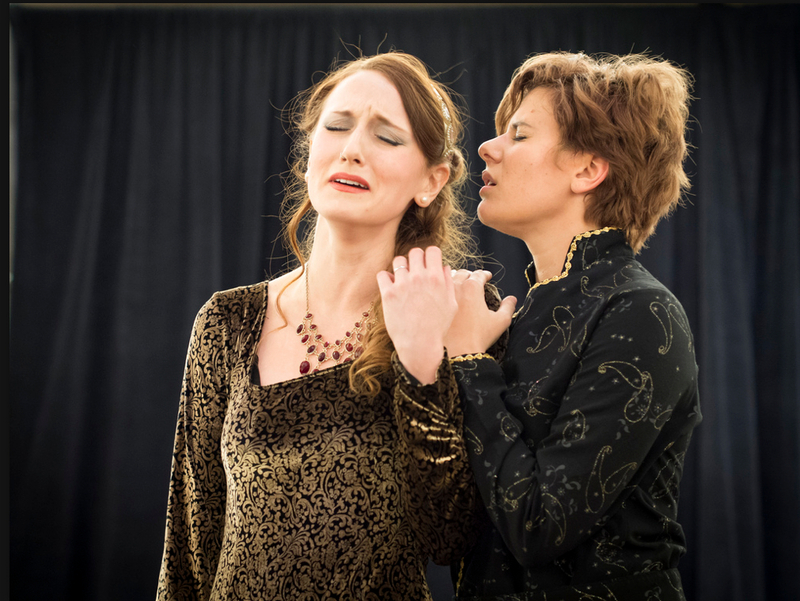 The ensemble won with the final duet from Act I of Handel’s "Giulio Cesare in Egitto.” In June 2012, the UO Opera Ensemble mounted a condensed production of the opera, recast as a science fiction epic, in Beall Concert Hall on the UO campus in Eugene. “I am so proud of our singers for achieving this strong second place,” said Karen Esquivel, director of the UO Opera Ensemble. “There was a lot of stiff competition from other schools, and the fact that this honor was awarded in our own backyard of Portland secured some national attention for our UO singers and programs,” she said. UO students and faculty also participated at the NOA in other ways. UO Opera Ensemble members Tim McCoy, Anne O'Dell, Alishia Piper, Beverly Taflinger and Michael Seregow, pianist, performed an extended scene from the chamber opera "An Embarrassing Position," by Boston-based composer Dan Shore. The performance netted Shore first place in the NOA’s Chamber Opera Composition competition. Now that they have returned from Portland, Esquivel is leading UO Opera Ensemble members in preparing for “Una Noche Encantada: An Evening of Spanish Opera,” a concert of two family-friendly, one-act musical stage works in Spanish. The UO Opera Ensemble will present the works in a two-night engagement in the Hult Center’s Soreng Theater on April 20 and 21. Tickets are available from the Hult Center box office, 541-682-5000. More information about the National Opera Association’s Collegiate Opera Scenes Competition is available at http://www.noa.org/competitions/opera-scenes-guidelines.html.